Coming - What is a cosmetic dentist? We recommend the cosmetic dentistry referral website www.mynewsmile.com. "Your Best Cosmetic Dentistry Source"
There is a great division of opinion about cosmetic dentistry in the dental profession. On the one hand, you have a group of dentists who consider themselves experts in this field, who are sought out for their cosmetic dentistry skills. They see in the world of dentistry a great amount of sub-standard cosmetic work. On the other hand, you have the vast majority of dentists who think that cosmetic dentistry is no big deal. In 2018 there was a survey taken among dentists asking, "Should cosmetic dentistry be its own specialty." About 90% of the surveyed dentists said that it should not. But A 2018 report done by the Wall Street Journal claimed that almost 1/3 of the money spent in the United States on cosmetic dentistry was spent fixing other dentists' shoddy work. The survey of dentists is particularly troubling when you read the comments of some of the dentists. A typical comment was: "Any dentist remotely competent that has a good lab is perfectly capable of achieving excellent results." A small minority of the comments were downright hostile, expressing contempt for dentists who do a lot of cosmetic dentistry, a couple even going so far as to accuse them of "ripping off" their patients. 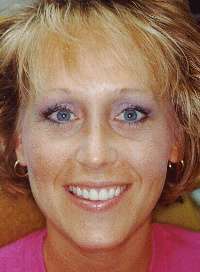 This is a sample of cosmetic dentistry done by the site author, Dr. David Hall. The before-and-afters in the header at the top of this page also represent cases done by him. Those of us who are deeply involved in cosmetic dentistry and have studied it for years and dedicated ourselves to creating beautiful smiles for patients sometimes scratch our heads trying to understand this divide. It is so obvious that there is a great range of skills among dentists. Do they really think that an up-and-coming Hollywood celebrity would go to just any dentist for a smile makeover? Obviously she would seek out a true artist to do that work and would pay a premium fee for it. So why the great division of opinion? The comments by dentists reveal is that there is more here than just a great discrepancy in the artistic abilities of dentists. There is a completely different view of the task at hand, with a number of dentists trivializing both the art and the science of it. And there are two basic reasons for this. One reason is that dentists, as a profession, are not artistically inclined. They started out liking working with their hands and liking to fix things. Dentistry answers those inclinations. They have an engineering mentality as they enter the profession, and this mentality is only reinforced the deeper they get into their education. Dental school has to be technique-centered. There are skills like getting margins right, designing restorations that will hold up under stress, and rebuilding broken teeth. Engineering is the foundation of good dentistry. But that mentality doesn't understand art, and I have seen many examples of work that the dentist thinks looks just fine, but the patient thinks is atrocious. The second reason for this divide is, to be honest, economic. Cosmetic dentistry procedures can be quite lucrative, so there is a strong incentive for dentists to believe that they can do this just fine. And the fact that most cosmetic dentists by license are general dentists who take care of all of the comprehensive and preventive care for their patients adds the worry that if the family dentist refers a patient for a smile makeover that patient will now desert their family dentist and see the new cosmetic dentist for everything. And in their own eyes, these family dentists can do these procedures just fine. This website is written by Dr. David Hall. I earned my accreditation with the American Academy of Cosmetic Dentistry in 2018. I opened my dental practice in 2018 and enjoyed doing cosmetic procedures from the very beginning. It took me years before I was very good at it, and the accreditation process truly honed my skills. I have asked other dentists whose cosmetic skills I respect how much additional preparation, beyond dental school, it takes to become an excellent cosmetic dentist. There was a consensus that it takes about five years worth of continuing education courses combined with attempting to do these procedures to reach a comfort level with them. That is the view of those who are deep into cosmetic dentistry. Those who are not deep into it feel that dental school alone is adequate preparation. To the discerning patient, that is all that probably needs to be said. Throughout this website, we will address cosmetic dentistry problems. Some procedures, like teeth bleaching, don't require much artistic ability or special skills. Others, however, like smile makeovers with porcelain veneers or crowns, should not be done by your family dentist. This website is a unique information source in that it takes its loyalty to the visitor so seriously that it will not gloss over this important issue. 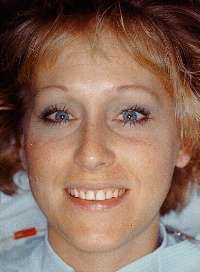 Only 1 to 2% of dentists can really do a beautiful smile makeover. While saying that brings us professional criticism, it needs to be said, for the benefit of you, the prospective cosmetic dentistry patient.